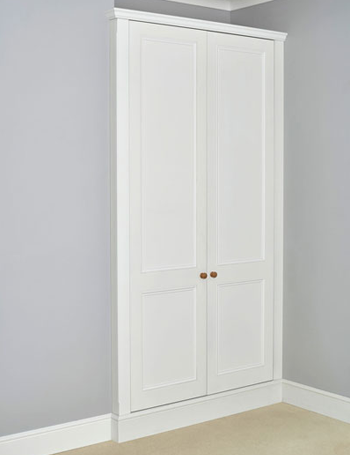 Save on price, not quality with our range of made to measure, flat pack DIY Alcove cabinets and wardrobes. At DIY Alcove Cabinets we offer bespoke cabinetry without the bespoke price tag. How do we do this? We keep our costs down as there’s no site visit and the cabinet fitting is done by you ! (or your local carpenter). 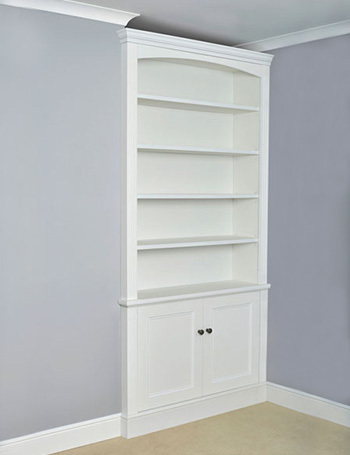 Our prices start from just £390 for a single full alcove dresser with soft close doors and height adjustable shelves (unprimed). 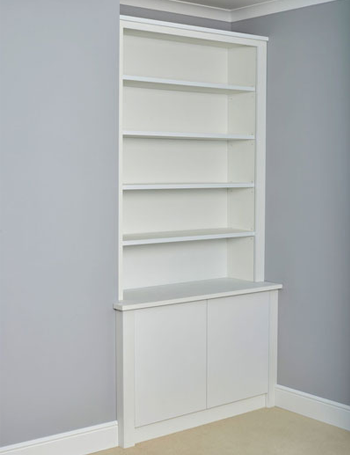 What’s more, you don’t have to be a DIY expert to install our alcove furniture. 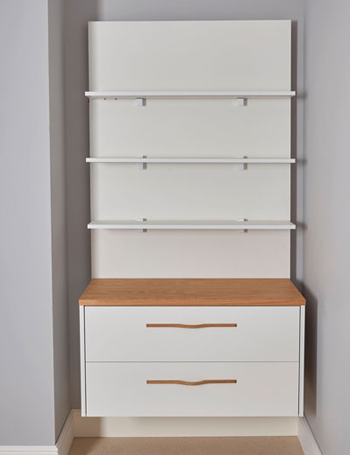 Installation is easy, we provide a flat pack ‘alcove cabinet kit’ that includes everything you need with easy to read, step by step instructions. Whether it’s traditional or contemporary style cabinets you’re after, you’ll find our full range of alcove cabinets and accessories on our online price calculator where you will get an instant quote. Or if its inspiration you need then check out our customer gallery. Rest assured we have over 25 years experience in the fitted furniture industry. We use the most up-to-date CNC (Computer Numerical Control) machinery to ensure total accuracy and use only premium quality materials and hardware. But don’t take our word for it, take a look at what our customers have to say. Wonky walls? Plug sockets in the way? Not a problem. See our FAQ’s and Glossary or give us a call. "The built in alcove units were brilliant, easy to assemble and look amazing. Thanks so much." "Despite not having much experience of DIY, we managed to put the furniture together easily due to the fact our alcove cabinet pieces were so well designed and cut. Overall we were so impressed with the way your company works that we wanted to say a big thank you! Thanks again for the excellent service and an excellent product." "I just wanted to say thank you for the cabinets. I fitted them at the weekend and they look great. Thanks for all your help and flexibility. Much appreciated." "I have worked with bespoke joinery firms for a long time (I have been in carpentry & joinery for 15 yrs) and would like to express how impressed I am with your product, everything fitted perfectly. As a result of your product it made the install easy and the client happy." "Thank you all for supplying my wonderful alcove cupboard. It’s absolutely stunning and just what I wanted to finish my Edwardian terrace living room. Thank you for supplying such a good quality product. I’ll certainly be back for more." "Just to say thank you to yourself and your team for our alcove cupboards. We are both extremely happy with the finish and quality. We fitted them with no issues despite some uneven walls in our 1930's house ! Will be in touch next year for some wardrobes for the bedroom !" "Thank you to DIY Alcove Cabinets for a great product at a great price." "Really loving our wardrobes. Thank you for all your help. We will definitely be recommending you to family and friends." "Thank you for our amazing radiator cabinet." "We love the clean seamless look of our cabinets, thank you for all your help and advice." "We’re delighted with the finished cabinets, they look brilliant and every visitor that comes to the house complements them. Thank you to the DIY Alcove Cabinets team for providing a great product and service at a very competitive price." "I am really impressed with our alcove units." "So thrilled with our cabinets, thank you ! It’s a fab product and service." "We love our new cabinets. They are a perfect fit. Thanks Again." "Just wanted to say how pleased we are with your units. Very clever system. Worth every penny." 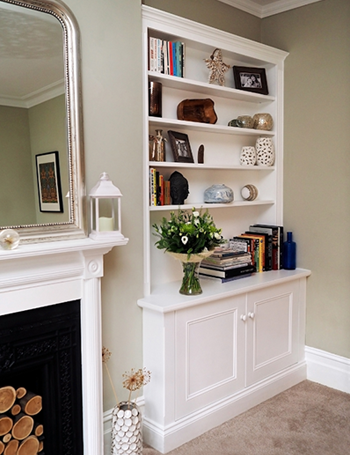 "We are delighted with our alcove furniture and thought you might like to see the finished results. Thank you for your help and advice." "I would just like to say thank you for the cabinets, they look great now the room is finished." "Just a quick note to say how impressed I was with the alcove units. Fitted in a day, minimal effort, maximum effect. Very satisfied indeed. The delivered units fitted perfectly." "We are so pleased with the cabinets; they finish off the room perfectly. Thanks again." "I just wanted to say thank you very much for our alcove cabinets. We love them ! We are extremely pleased with the finish and fitting, they look great." "Delighted with our alcove units." "We're more than happy with the cabinets and think they look fantastic. We will be recommending you to others." "Really happy with these cabinets. Thank you for your help and advice." "We chose DIY Alcove Cabinets because of the cost savings. The alcove cupboards took a day to fit and the finished products look amazing. We’ve already recommended you to another family member and wouldn’t hesitate to order again." We’re always here at the end of the phone ! Please call us for advice on style, fitting options, measuring and installation.